Ella Fitzgerald’s ‘Ella Abraça Jobim’ is a studio album devoted to the songs of Antonio Carlos Jobim and recorded on September 17–19, 1980 and March 18–20, 1981. Track listing : . 1.Somewhere in the Hills (Favela) (Vinícius de Moraes, Ray Gilbert, Antonio Carlos Jobim) – 03:56 . 2.The Girl from Ipanema (Vinícius de Moraes, Norman Gimbel, Antonio Carlos Jobim) – 03:50 . 3.Dindi (Ray Gilbert, Aloysio Oliveira, Antonio Carlos Jobim) – 06:37 . 4.Desafinado (Off Key) (Jesse Cavanaugh, Jon Hendricks, Newton Mendonça, Antonio Carlos Jobim) – 03:41 . 5.Water to Drink (Vinícius de Moraes, Norman Gimbel, Antonio Carlos Jobim) – 02:44 . 6.Dreamer (Vivo Sonhando) (Gene Lees, Antonio Carlos Jobim) – 04:55 . 7.Corcovado (Gene Lees, Antonio Carlos Jobim) – 05:40 . 8.Bonita (Ray Gilbert, Gene Lees, Antonio Carlos Jobim) – 02:50 . 9.One Note Samba (Newton Mendonça, Jon Hendricks, Antonio Carlos Jobim) – 03:51 . 10.Don’t Ever Go Away (Por Causa de Voce) (Ray Gilbert, Dolores Duran, Antonio Carlos Jobim) – 02:52 . 11.Triste (Antonio Carlos Jobim) – 04:07 . 12.How Insensitive (Vinícius de Moraes, Norman Gimbel, Antonio Carlos Jobim) – 03:00 . 13.He’s a Carioca (Ele É Carioca) (Vinícius de Moraes, Ray Gilbert, Antonio Carlos Jobim) – 05:14 . 14.This Love That I’ve Found (Só Tinha de Ser Com Você) (Aloysio Oliveira, Antonio Carlos Jobim) – 05:17 . 15.A Felicidade (Vinícius de Moraes, Antonio Carlos Jobim) – 02:19 . 16.Wave (Antonio Carlos Jobim) – 05:22 . 17.Song of the Jet (Samba Do Avião) (Gene Lees, Antonio Carlos Jobim) – 03:40 . 18.Photograph (Fotografia) (Ray Gilbert, Antonio Carlos Jobim) – 03:49 . 19.Useless Landscape (Inútil Paisagem) (Ray Gilbert, Aloysio Oliveira, Antonio Carlos Jobim) – 07:59 . Musicians : . 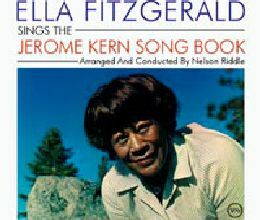 Ella Fitzgerald – Vocals . Clark Terry – Trumpet . Zoot Sims – Tenor Saxophone . Toots Thielemans – Harmonica . Henry Trotter – Keyboard . Mike Lang – Keyboards . Clarence McDonald – Piano . Joe Pass – Guitar . Oscar Castro-Neves – Guitar (Rhythm) . Paul Jackson, Jr. – Guitar (Rhythm) . Mitch Holder – Guitar (Rhythm) . Ronald Bautiste – Guitar (Rhythm) . Abraham Laboriel – Double Bass . Alex Acuña – Drums . Paulinho da Costa – Percussion . Production . Produced by Norman Granz . Paul Aronoff Engineer . Humberto Gatica Engineer . Package : . Norman Granz Liner Notes . Tad Hershorn Photography . Recorded September 17–19, 1980, March 18–20, 1981 Hollywood, Los Angeles . Released in 1981 by Pablo.